A Crate from Super Smash Bros. Brawl. 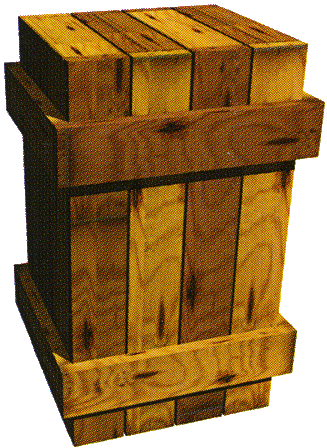 Crates (also known as Wooden Crates) are wooden boxes found in many Super Mario games, as well as in several of their spin-offs. They mostly appear in these games as obstacles and objects, and occasionally contain items inside. Crates first appeared in Super Mario Bros. 3. In this game, they appear only in airships. Crates appear to be in the background, but Mario/Luigi can stand on top of them. A Crate in Super Mario 64. A Crate in Super Mario 64 DS. Crates, this time looking to be made out of a cork-like material, reappear in Super Mario 64. They are items that can be picked up and thrown at an enemy, usually containing Coins, and they resemble smaller versions of the game's Blocks. In Super Mario 64 DS, they appear to be made of wooden planks and are somewhat less common. If Yoshi swallows a Crate, he can produce a cube-shaped Yoshi Egg. A different, specific crate appears in Jolly Roger Bay on the bridge of the sunken ship. This specific crate, known as a Slide Box, is larger and has a darker shade of color, with a picture of a skeleton on the front and back. It slides on the bridge of the sunken ship. Unlike other Crates, the Slide Box cannot be picked up or thrown, as it is indestructible. Being hit by this crate causes the player to lose a slice from their Health Meter. Crates also appear on Isle Delfino in Super Mario Sunshine. They can only be destroyed by ground pounding them, which typically reveals a coin. In addition, there is a man in Delfino Plaza named the Crate Guy, who has crates stacked in various patterns. If Mario walks into his building, the player can talk to him and is given the option to play a minigame, which involves destroying all the crates in the room in thirty seconds. Doing so successfully reveals to the player a Shine Sprite. Crates also appear in Super Mario Galaxy, where they are stationary items that can be broken using the spin to reveal items, often Star Bits or coins. Crates also appear in New Super Mario Bros. Wii and New Super Mario Bros. U. They either appear wooden or metallic, with the wooden ones being breakable with Ground Pounds. They reveal coins or even power-ups when destroyed. The metal crates are indestructible, and can make the player lose a life if it falls on top of them. In New Super Mario Bros. U, the metallic crates now feature Bowser's symbol on them, but crates in general are otherwise unchanged. There are also crates found in Ghost Houses that can be broken by Broozers. Crates as seen in Super Mario Galaxy 2. The crates from the first game also appear in Super Mario Galaxy 2 and shares the same function as the first game. They appear in secret missions for the Rightside Down Galaxy and the Upside Dizzy Galaxy. During these missions, Mario, as Fire Mario, must destroy all the crates on the platform within twenty seconds in order to get a Power Star in the Crate Burning minigame. There are also metal-edged variants of crates, which are a little different to the normal ones. These ones are a bit stronger - once a fireball (from Fire Mario or Fire Luigi) destroys one, the fireball disappears instead of burning through it and destroying other crates in the way like the normal ones. Getting crushed by these crates causes Mario or Luigi to lose a life. A crate in Super Mario 3D Land. Crates, having the same design as the ones from the Super Mario Galaxy games, reappear in Super Mario 3D Land. Mario can break them by rolling into them, or throwing fireballs or boomerangs at them. They may also be destroyed by running through them while invincible. Crates return in Super Mario 3D World, appearing and functioning exactly the same as in Super Mario 3D Land. Crates appear in Super Mario Odyssey, where they serve as stationary items that can be broken using Cappy. Occasionally, a Power Moon can be found in a crate, causing it to glow. Mini Goombas can also be found by breaking some crates. Crates appear again in Super Mario World 2: Yoshi's Island and its remake Yoshi's Island: Super Mario Advance 3. This time, can be broken by Ground Pound to open them and release either Stars or a Key. Balloons hold crates in the air, and they can be shot down by a Yoshi Egg. These crates reappear in Yoshi's Island DS and Yoshi's New Island. Throughout the Donkey Kong franchise, there are Animal Crates where an Animal Friend can be obtained. In Donkey Kong Country 2: Diddy's Kong Quest, there are generic crates that Diddy and Dixie Kong can pick up and throw. They are used like Barrels, except that they immediately break when hitting the ground (much like Vine Barrels from Donkey Kong Country). The main use of crates is for defeating enemies, especially ones that are harder to defeat, such as Zingers. In Donkey Kong Country 3: Dixie Kong's Double Trouble!, there is a single Crate in the level Barrel Drop Bounce. It acts the same as the crates from Donkey Kong Country 2. In the Game Boy Advance version, the single Crate is replaced by a Barrel, making Crates completely absent in that version. Crates of different sizes appear among Snowmad cargo in the levels Mangrove Cove and Shipwreck Shore from Donkey Kong Country: Tropical Freeze. Many of them, namely the large crates as well as several small ones, display the Snowmad insignia on their front sides. They are commonly arranged in stacks and act as platforms. However, they can also be smashed with a single Ground Pound, revealing items such as bananas, banana bunches and hearts. 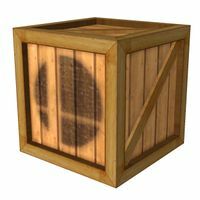 A Crate is also an item container featured in Super Smash Bros.. Like all other containers, the Crate must be broken before the items inside can be used in battle. To break the carrier, the wooden Crate can either be picked up and tossed in the air, or be attacked repeatedly on the ground. Crates can also be thrown at opponents, although it is difficult to hit other fighters, as throwing the container takes a long amount of time. Sometimes, Crates explode under enough stress, damaging all nearby fighters. In the original Super Smash Bros., the Crate holds one to three items, and is also extremely heavy. In fact, only Donkey Kong can lift up the Crate and walk around with it; all the other fighters can only pick up the container and toss it while they stay still. In Super Smash Bros. Melee, the Crate's carrying capacity is increased, revealing anywhere from three to five items when broken. The Crate is still very heavy, although all fighters can pick up the container and walk with it (albeit most can only walk very slowly because of the container's weight). Again, only Donkey Kong can walk at a relatively normal speed with a Crate in hand. In Super Smash Bros. Brawl, a crate changes its appearance depending on the environment. For example, if it is in a Star Fox series stage, it turns into a chrome Crate. This does not change its effect, however. The game also introduces the Rolling Crate, a Crate that slides across the floor, and the Blast Box, a dangerous item that can explode if it is thrown. A wooden Rolling Crate and two Crates in Super Smash Bros. for Wii U. Crates, along with Rolling Crates, return in Super Smash Bros. for Nintendo 3DS and Super Smash Bros. for Wii U. While the wooden variation retains its usual design, the futuristic Crates have a different appearance with the Super Smash Bros. symbol, and lids can be seen on the present-like Crates. Crates return in Super Smash Bros. Ultimate, with the same designs as in Super Smash Bros. for Nintendo 3DS / Wii U. Crates appear in the Unithorn's Lair area in Wario World. Here, most of the crates contain Smiley Bombs, which can damage Wario and distract the Unithorns. However, one crate contains an Escape Spring that allows Wario to leave the area. Crates appear in several levels in Paper Mario: Color Splash. When broken, they can drop paint, Coins, or Battle Cards. A Crate in The Golden Coliseum contains a Super Star inside of it. Crates must be fully painted before Mario can destroy them. N64 Super Smash Bros. Item holders. You can destroy these to get at the items they contain, but be careful, because they will sometimes explode when broken. In Super Smash Bros. Melee, crates were uniform in design, but this time around, their appearance will change to match the stages. They'll sometimes look futuristic--other times, they'll look like presents with fancy ribbons. Wii U Super Smash Bros. for Wii U Throw or attack this crate to bust it open and get the goodies hidden inside. The crate may look different based on the stage you're battling on, but the items inside won't change. Sometimes these things can explode, however, so it's best to be very crateful around them... Just throw or attack crates to get at the goodies inside! Their appearance changes depending on the stage, so maybe you'll get a wooden crate, or...maybe you won't. That doesn't change how it is on the inside, though, which is a good life lesson. Also, it may just explode if you attack it - another important life lesson from us to you. This page was last edited on March 21, 2019, at 06:59.